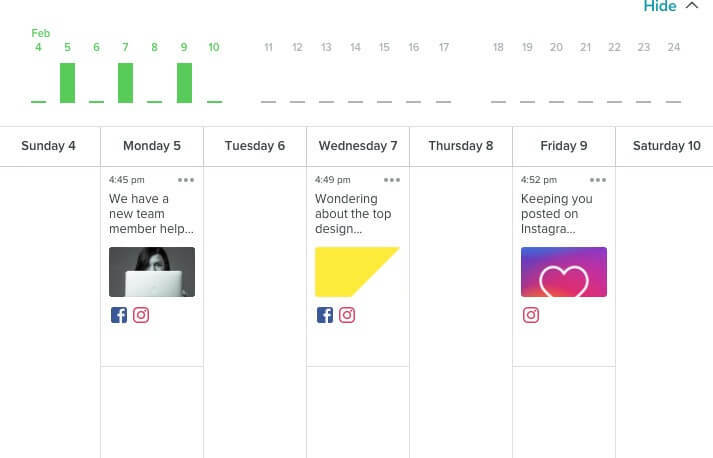 Your business can now schedule posts on Instagram! Much to social media manager’s delight, Instagram has announced on their business blog that they will be introducing new features to their API, such as allowing businesses to schedule photo posts directly from a third-party apps like Sprout Social or Hootsuite. Instagram has historically been very encouraging of posting in the moment. Though, with recent changes, they have removed the chronological timeline—allowing users to post stories that are more than 24 hours old—and added the ability to highlight past stories. This could be an indication that the platform may be moving away from real-time posting. Before, if businesses wanted to schedule posts their only option was to pre-write captions and receive a push notification when they had “scheduled” their post. This new update can save social media managers a ton of time, and will make scheduling in Instagram content much more efficient. The first update to Instagram’s API will only allow scheduling for business accounts and you’ll only be able to use the feature on one of Instagram’s partner programs like Hootsuite or Sprout Social. According to Instagram the new post scheduling feature should be available to personal accounts by early 2019. Need help managing your business or corporate Instagram account? Get in touch with us today!